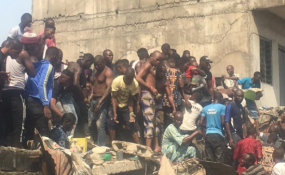 A three-story building has collapsed in a densely populated area of Lagos, with some fearing that schoolchildren remain inside. Figures of those trapped are unclear, reported DW's West Africa correspondent. Nigerian emergency services said on Wednesday that a building collapsed, possibly trapping schoolchildren inside. The Nigerian news station Channels TV reported that a school was located on the top floor of the building, adding it collapsed "with pupils feared killed and others trapped." Over the past five years, more than 170 people have been killed in building collapses in Nigeria. DW's West Africa correspondent Fanny Facsar reported there was "conflicting information on number of people inside the building and location of primary school inside building. Possibly "50 to 100 people, many of them children believed to be trapped inside trapped inside the building," Facsar said in a tweet.